Whether baby's going down for a nap or a full night's rest, sleep peacefully knowing your little one is safe and secure in this adorable wearable blanket. 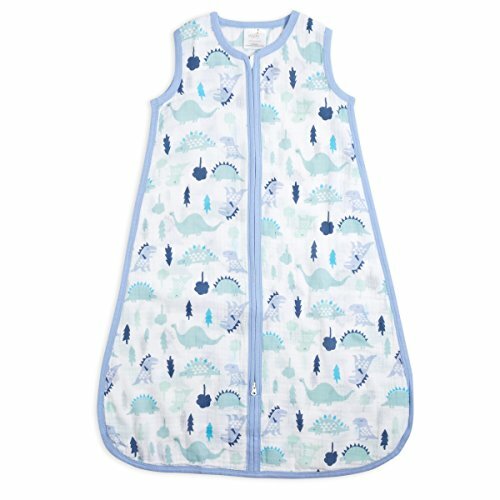 This aden by aden + anais sleeping bag is completely machine washable and a practical infant garment for babies 0-36 months old to wear to bed over their pajamas. The perfect solution to get rid of loose blankets in your little one's crib, our wearable blanket is made with 100% breathable cotton muslin. The easy zip-up makes nighttime changes a breeze and offers a safe alternative for a good night's sleep. The round neckline and lightweight woven fabric means this little number is practical all year long. During colder seasons, bundle baby in layers of warmer sleepwear underneath this wearable sleeping bag, and dress baby in lightweight pajamas in warmer months. The pre-washed 100% cotton muslin material is breathable to reduce the risk of overheating at night. The touchable softness of this aden by aden + anais sleeping bag is gentle on the delicate skin of newborn babies and will give parents a peace of mind every single bedtime. Easy Care: Machine wash sleeping bag before first use in warm water and with like colors. Tumble dry low and do not iron. Safe: Helps to reduce the risk of overheating and eliminates the needs for loose blankets in baby's crib. If you have any questions about this product by aden by aden + anais, contact us by completing and submitting the form below. If you are looking for a specif part number, please include it with your message.